This page was created in order to keep parishioners informed about the proposed merger of the parishes of St. James the Apostle in Trumansburg, St. Francis Solanus in Interlaken, and Holy Cross in Ovid. The Bishop of Rochester has come to the conclusion that “one faith community better serves our mission as disciples of Jesus Christ.” Bishop Matano explains his reasoning for merging the three parishes in a letter dated October 1, 2015, which is available below. In February 2016 Bishop Mattano affirmed his support of a Mass schedule that includes at least one weekend Masses at each of the three churches. He conveyed his gratitude to Fr. Bernard and the planning team for all the work being done to create a unified faith community and ensure a vibrant Catholic presence between Cayuga and Seneca Lakes. This new Mass schedule requires sacrifices and adjustments from parishioners across the three parishes—families with children and teens getting up earlier on Sunday mornings; regular Saturday night Mass goers changing to a Sunday morning Mass; and early Sunday morning Mass goers choosing either to go on Saturday, later on Sunday, or possibly attending a different church in the same parish. Please do your best to adjust your weekend routine so that celebration of the Eucharist with our community continues to be a priority in our lives. 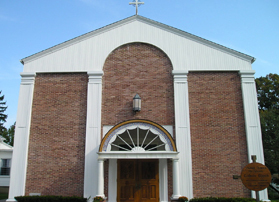 In May the Bishop issued a decree stating that the parishes of St. Francis Solanus Catholic Church in Interlaken, the Church of the Holy Cross in Ovid, and St. James the Apostle Church in Trumansburg shall be “amalgamated one to another and so be constituted as a single parish.” The effective date of the decree was the first day of July, 2016. In June the Bishop decreed that the name for the parish will be Mary, Mother of Mercy. The parish council members of the three parishes chose the following of many suggestions presented by parishioners. In order of preference they were: Divine Mercy; St. Pio of Pietrecina; Mary, Mother of Mercy; Christ Our Light; and Bl. Teresa of Calcutta. On June 3, the proposed names, by letter, were presented to Bishop Matano who has the responsibility of naming a parish. In a letter dated June 6, 2016, in which he decreed the new name, Bishop Matano wrote: “This title seems to embrace all the themes and virtues contained in the other proposed titles and the exiting titles of the Churches.” Beginning July 1, 2016, the three churches, who maintain their individual building names, were united under the one parish name of Mary, Mother of Mercy. The corporate merge of the three parishes is still pending. The work of the planning committee concluded with their final meeting in June. The new pastoral council will now work with Fr. Bernard to set pastoral priorities and ensure good communication with parishioners. Attention will need to be given to creating events to bring people of the new parish together, to ensuring that people are warmly welcomed at Masses, and to continuing the traditions of the three churches. Once the civil merger of the three parishes is complete, a shared finance council will be formed. David Zellinger (regional finance director). Minutes of the committee’s meetings are available here. The committee’s final meeting was held on Wednesday, June 22, 2016, at St. Francis Solanus, Interlaken.